What would a trip to the Paris be without a visit to some prestigious museums, galleries and fashion exhibitions? Unfortunately the Musée Galliera, Paris’s museum of fashion, was closed for renovation whilst we were due to visit the capital however luckily, all exhibitions were held offsite. I did my research before we left and found two exhibitions that sounded really interesting and perfect for the units I’m studying at the moment. The Paris Haute Couture Exhibition was being held at Hôtel de Ville and despite going on the only day it wasn’t open, it was well worth a returning visit. 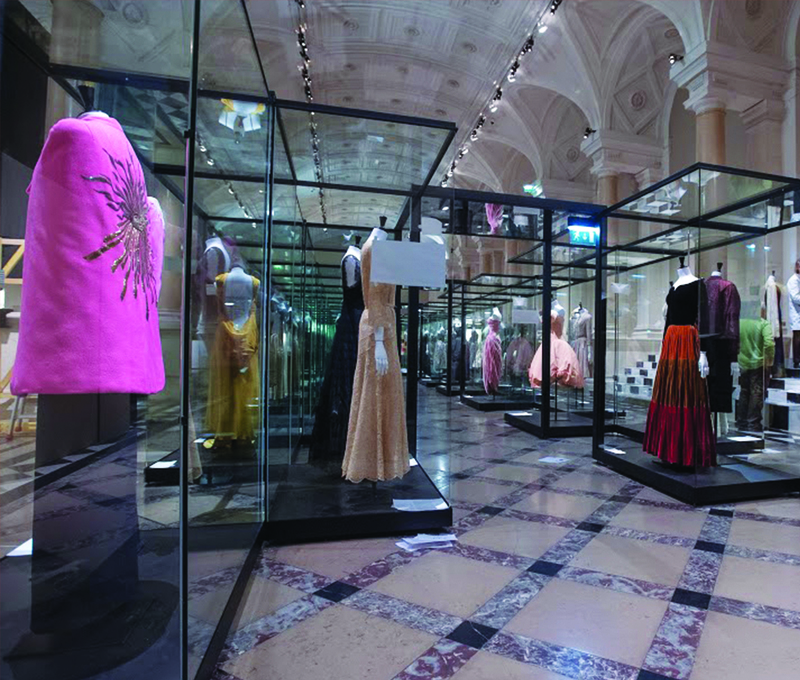 The exhibition boasted around one hundred haute couture garments from designers such as Worth, Chanel, Lanvin, Poiret, Vionnet, Dior and Balenciaga among many others. The exhibition told the story of this high end, luxury industry and its importance and influence on fashion. Illustrations were on display showing garment design and construction whilst fashion films gave an insight into the creation and establishment of haute couture in Paris. Entry was free and whilst everything was in French (booo) seeing the garments in real life and the stories behind them was pretty amazing and I’m so glad I went. I got to see Schiaparelli’s shocking pink Medusa cape from her Zodiac collection up close (which was very very pink!) aswell as her suede gloves with gold talons and felt like I’d shared a huge piece of French fashion history as a result. I saw the famous Chanel suit and really appreciated the cut of Vionnets dresses. Seeing these pieces of fashion history right infront of me made me appreciate the garments so much more and if you’re ever in Paris before July 2013 I would recommend a visit! Although I couldn’t purchase any books (there weren’t any English versions) I managed to grab some inspirational postcards and I’m hoping to buy a copy of the exhibition catalogue online. Hope you’re inspired as much as I was! The Medusa Cape by Schiaparelli which was SO pink and this amazing masterpiece by John Galliano for Christian Dior’s SS 1998 collection. The detail was amazing up close. More information on the exhibition can be found here. All in all it was a pretty surreal day that provided a real insight into the history of Couture in Paris and showcased the work of some of the most famous and influential designers to date. There were pieces from every decade and it was fun navigating my way through Vionnet and Chanel, Worth and Balenciaga to understand the world of couture as it was and is now.